Hibernian chairman Rod Petrie admits the team's Scottish Premiership performance this season has been "a dismal outcome". Terry Butcher's side finished in the top flight's relegation play-off spot and will play either Hamilton Academical or Falkirk over two legs. 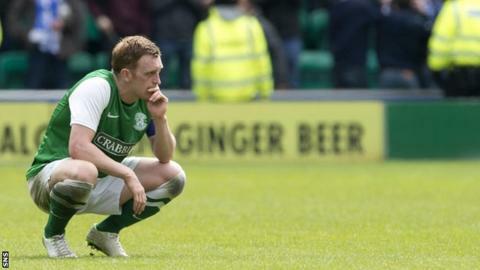 Hibs' fate was sealed by a 1-0 defeat by Kilmarnock on Saturday. "We are sorry not to have achieved better results in 2014," Petrie told the club website." Butcher took over from Pat Fenlon in November but has been unable to prevent a descent into an 11th-place finish. And Hibs now face the prospect of dropping out of the top flight for the first time in 15 years. "Saturday's match against Kilmarnock was like our whole season in one match - commitment and energy from the players to put ourselves in a good position, but without a result," explained Petrie. "The team was driven on by passionate supporters who want the best for their team and the best for their club. The club thanks you for playing your part. "The league campaign is over. Eleventh in the table is a dismal outcome - well below what the club expects and well below the capabilities of the management team and the players. "In 10 days we have a play-off to win over two legs. The players and the manager need your support to make sure we take care of business on the field and finally put this season behind us." Hibernian recently announced that Leeann Dempster would be joining the club as chief executive from Motherwell this summer. And Petrie has promised supporters "further radical change". "Looking ahead, 2014 will be a year of change for Hibernian," he added. "Day-to-day responsibility for running of the club will pass to Leeann - a change which has been universally welcomed by Hibernian supporters. "There are other changes in the pipeline too which will see further radical change at your club both in the way that it organises itself and in the way in which it engages with the Hibernian family and the wider community. "Leeann will need your support to implement change. "I have to ask for your patience and for your support for the team both on and off the pitch. We have to keep the focus of our attention on the team and on the sporting result we need. "As we move through the summer and into the start of next season the wind of change will blow through the club to enrich and reinvigorate it for the benefit of every Hibernian supporter."